Probashbangla24 online Desk : The far-right candidate, Jair Bolsonaro, has won the first round of Brazil’s presidential election. Mr Bolsonaro, a Catholic, won the support of many evangelical Christians by saying he would defend traditional family values. He has also won over many Brazilians who think his law-and-order stance will make Brazil safer. On the eve of Sunday’s vote, he said that is government would hand down the tough punishments offenders deserved. He is also in favour of relaxing gun ownership laws and has spoken of torture as a legitimate practice. He also wants to restore the death penalty. In his victory speech, broadcast live on Facebook and uploaded onto Twitter, he said that were two paths Brazilians could follow. How did Mr Haddad respond? 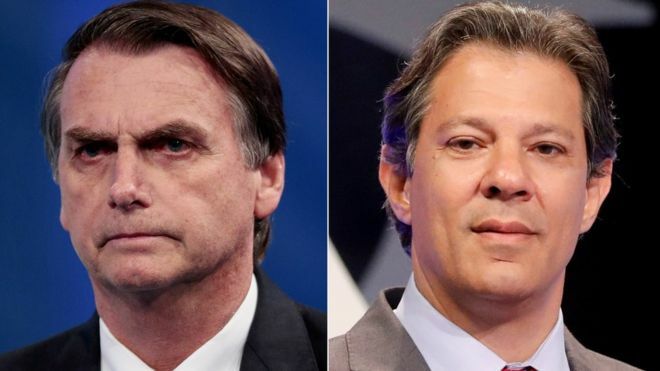 Mr Haddad has portrayed himself as a trusted candidate for those who baulk at Mr Bolsonaro’s style and rhetoric. Speaking after he had made it into the second round, he said that he and the Workers’ Party would “only use arguments, we don’t use any guns”. Referring to Mr Bolsonaro’s lead he said that he felt “challenged by the results, which alerts us to the risks Brazilian democracy is facing”. “We need to approach this with a sense of responsibility. We want to unite the democrats of this country, to reduce inequality and to achieve social justice,” he told his cheering supporters.